Today was another GLORIOUS day in Boston, and the Ural is grounded because we’re up against our 500km service, but we decided to put on just a few more clicks, and give the dogs another opportunity to acclimatize to the Ural. Brought the rig to the house around 11 or 11:30AM and started working on installing our mounting system so we can hook the dogs’ harnesses into the Ural. The mounting system installed very easily (frighteningly so) but the door was more of an issue, ultimately involving the Dremel, hammer, the creative use of cord, and some future riveting. All said, it was around 3PM when we’d had lunch and were ready to take the dogs out for a ride. 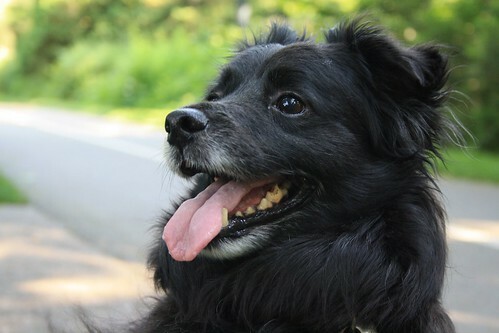 We decided to take them to Fresh Pond – it’s only a few miles away, and there’s a pretty lake there with a walking path, lots of chipmunks to chase, dogs to meet and even a little pond where the dogs can splash around and swim if they want to. It’s Ben’s idea of paradise, and we figure he can use all of the positive associations with the Ural that he can get since he wasn’t too keen on it at first, so it was the perfect spot to ride to. Only one problem: they’re VERY persnickety about parking in the parking lot there. I registered the Ural with the city to get a parking pass just so I could park in that lot. If you’re not a resident, you’ll get ticketed for parking there. Unfortunately, Kay’s bike doesn’t have a resident parking sticker… so we decided he’d ride pillion and we’d all go on the Ural. So we all piled into/onto the bike and took off to Fresh Pond! When we were getting ready, we put the harnesses on the dogs first and Bandido was UBER excited! While Kay and I were gearing up, ‘dido was doing something along the lines of: “BARK! BARK!” *VIBRATE! * *BOUNCE! * “BARK!” We were both a little surprised that he seemed so excited after only a quick jaunt around the block the other day, but he clearly knew what was up and he WANTED it. Ben was his typical calm self. He let us put the harness on him, waited patiently to go out, and then couldn’t be convinced to hop into the sidecar. Instead of trying to convince him, I just picked him up and loaded him in. We hooked them into their new harness restraint systems, put on the door, and they were all set! See how chill 'dido is looking already? 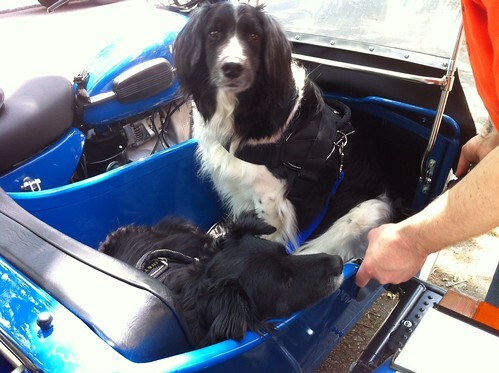 The dogs seemed much more comfortable in the sidecar today – especially Bandido. I was happy to see that they were able to change positions easily, even with the leashes – the down-low and on the side attachments seem to make it easy for the dogs to step over when they shift positions. Bandido spent most of the ride with his head on my knee, looking out between the sidecar and the bike. Ben alternated between looking at me and looking out at the people on the sidewalk. 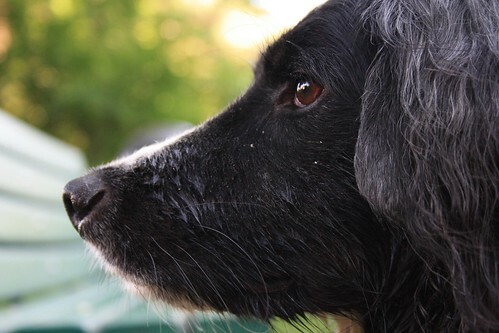 Kay got a chance to practice his canine photography skills with the good camera. The dogs got some good exercise and some positive associations with being out in the Ural. And we had a chance to test out the mounting system and ride for the first time with the dogs as ballast. On the way home, we got routed a different way because of stupid turn restrictions and some Sunday road closures, so we ended up driving the Ural through Harvard Square with the dogs. On a beautiful sunny Sunday afternoon. The weekend of Harvard University graduation. Suffice it to say, there were a TON of people out to witness our dogs in the Ural. And we’ve discovered something: our happy dogs, in a shiny blue Ural with white pinstripe, equals a SMILE MACHINE! 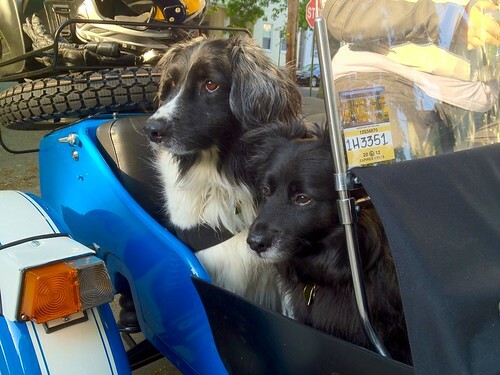 The dogs seemed much more calm in the sidecar when we got home than on their first outing around the block on Friday. I think it was partially the exercise, and partially that they’re adjusting to the sidecar – they were very chill when we got home. They waited patiently in the rig without trying to jump out while we futzed around, and when we took off the door and asked them to “Hop out” – Ben jumped down, but not like he couldn’t wait to get out of the thing. He waited to be asked. Bandido didn’t want to come out and had to be physically picked up and put down on the sidewalk, but I think he just loves the sidecar rig. In all, I think the dogs are acclimating nicely to riding in the rig. I’ll do a couple more around-town rides later this week (after the 500km service) and maybe next weekend we can take them for a longer ride. The weekend after, we’re scheduled to be riding up to New Hampshire with the dogs for our first camping weekend – I hope they’re ready by then!